I’ll guide you through the whole process from ideation to research, prototyping and final exhibition concept. The main focus of this project was to gain a deep understanding in the culture of dreams but also to design for and around such an exciting experience. Conceptvideo, Are dreams meant to stay secrets? My thesis builds upon the hyperawareness of our body. New technology – especially in the field of quantified-self movement – gives us the possibility of self-monitoring close to everything about the physical state of our body as well as our mental state. We know how many steps we walk, on what fitness level we are. We know how much we eat & how many calories we are still allowed to eat. We know how productive we are during work time and what situations increase our blood values. 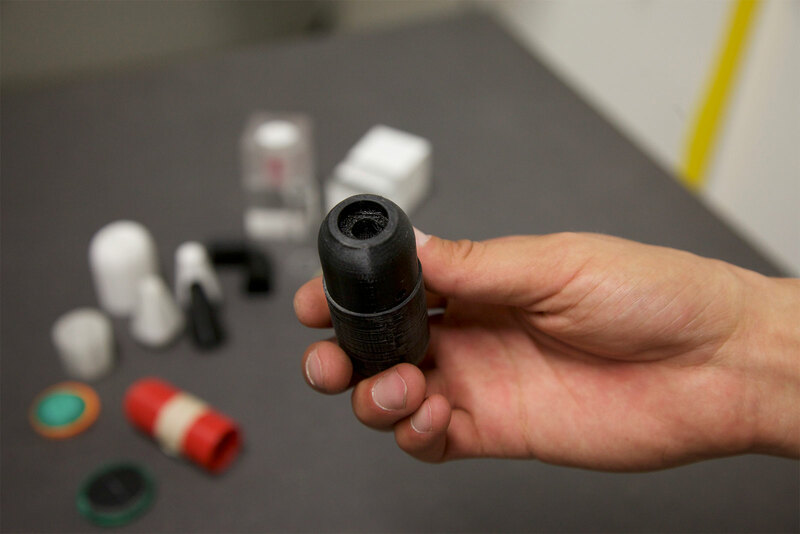 We can even measure how we clean our teeth. Even if we could measure our body and brain accurately and get more efficient in our daily life with this gained knowledge and data, 1/3 of our life we are still sleeping. That’s more than we do anything else. And of course, we do need sleep, to be capable of doing what we want to do. But when we sleep we also dream. However, 95% of all dreams fade away even before we left the bed. My assumption is that the quantified-dream is the next step of the quantified-self. We could even call it the meaningful-self. So, what if we could enhance the efficiency of dreaming? Make the dream phases longer and more often but also be more aware of what we are dreaming and even control the dreams into the direction we want them to go. Maybe even doing things we didn‘t find time during the day, so we catch up while dreaming? Those questions offer a lot of possibilities but also open up a critical dialogue. I want to focus on both, the possible & the impossible and conclude this in a critical examination of the efficient dream. With the help of a future cone (or rather a future landscape), I outlined a first draft of how a more efficient dream world could look like. It plays with progressive technology and stories that sci-fi films like Inception are based on, but also studies in science that tries to figure out why and how we dream. The map is divided into three main phases. 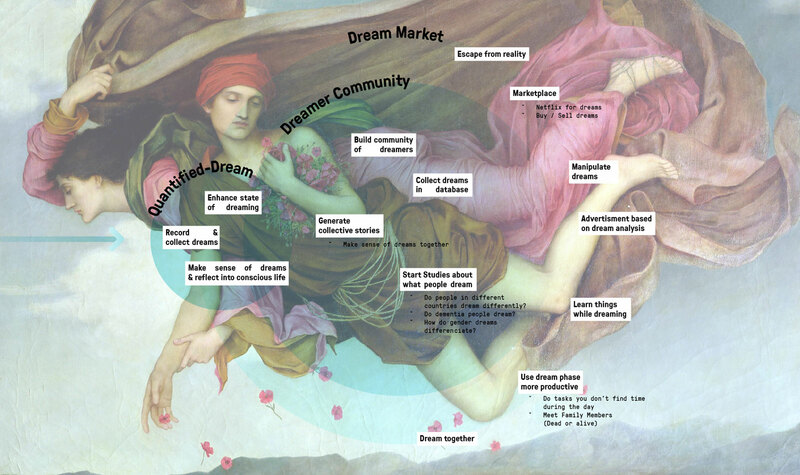 The quantified-dream, the dreamer community & the dream market. The quantified dream covers the enhancement and efficiency of dreaming. It‘s a probable future or even the future some people are living in right now. In the quantified-dream we have tools to record & collect our dreams, can enhance our state of dreaming with (lucid) dreaming devices & have the knowledge to make sense of dreams & can reflect them into our conscious life. Building upon the quantified dream, communities similar to the quantified-self movement, start to shape and organize. There could be huge datasets that collect our dreams, sort them by topic, emotion or other parameters. This could help understand how people with different cultural backgrounds dream. What people dream about when specific events like earthquakes happen. To find out how genders differentiate while dreaming and also how people with dementia and other illnesses dream. Besides those dream studies, dream communities could also exchange their dreams and try to make sense of their dreams or build collective dream stories. The dream market opens up the most questions about what impact (good or bad) a more efficient dream world could have. There might be a marketplace where dreamers could buy and sell their dreams. Companies like Disney might be interested in dream stories. There might be a Netflix for dreams, where dreamers could buy dream stories they want to dream about. Companies or state institution might manipulate our dreams, transplant ideas or products in our head. There might be a huge new advertisement market based on dream analysis. But we might also use the dream market to learn things while we are dreaming. The dreams might be used to learn new languages, specific sports movements or math solutions. This would mean that our dream phases would be used more productive. We might do tasks, we don‘t find time during the day. Meet family members (dead or alive) we would not meet else. And we might also dream together, similar to the plot of the film Inception. Through self-experiments I wanted to enhance my dreaming phases but also force myself into what is called the holy grail of dreaming – lucid dreaming. I also wanted to find how I could use dreaming as the main driver for creative problem-solving tasks. And how creative dreamers in the past made use of their dreams for their work. Through reading a variety of cultural dreaming theories and methods as well as reports and papers from anthropologist, psychologist and sociologist as well as poets, I wanted to deepen my knowledge why and how we dream. I also focus on how different cultures dream and use their dreams in their conscious life. With a cultural probe, where I invited some fellow dreamers to catch their dreams, I obtained some further knowledge and could also test some of my ideas and experiments. The influence of sleep and dreams for the creative process is a technique that some of the greatest minds used as an influence for their work. Salvador Dali, the master of surrealism for example used a technique where he did hold a key in his right hand and beneath his hand was a plate. Once he fell into a deep sleep, his hand releases the key which clangs onto the plate so he awoke with a refreshed mind ready to get weird again. But also other geniuses like Einstein, Ludwig van Beethoven or Aristotle used the power of dreaming for their work and other problem-solving tasks. Based on my research of how creative people in the past used their dreams for their creative work. I started outline three personas that use their dreams actively to be more creative, foster new ideas & test them in a protected environment. There is Thomaé – a surreal VR artist who embodies his dreams while asleep, Frederik – a copy writer and best selling author who uses his dreams like a puppet master and Samara – an Interventionist who conducts social design problems from a dream-like perspective. All of those three personas enhance their dreams with nearly invisible technological devices. These devices let‘s them dream more vividly, focus on specific problems & helps them reflect on their dreams. I imagine this device to act like a box which you can feed with specific inputs, like sketches, or an initial idea. 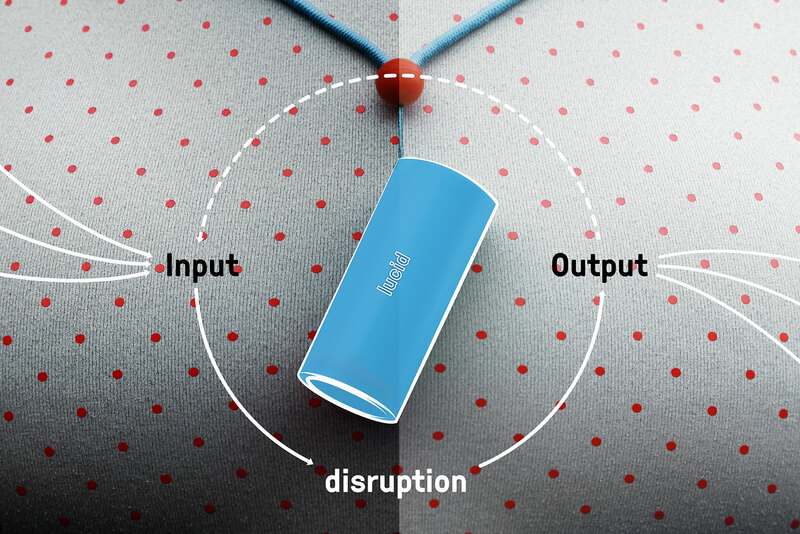 A disruption mode while asleep, that helps control the dreaming states and our body. And last but not least an output system that connects our creative dreaming experience in a loop with our creative process. Thomaé learned some new skills to express his ideas during dream time. He doesn‘t want to control his dreams but be controlled by his dreams. He has a lot of very disturbing dreams, other people would call nightmares. He takes dreaming as an inspirational form of his self & builds up an embodied relationship between his dreams & art practice. He is like a Dali of the modern age. He uses a technique where he would fall asleep in an armchair during his work. Through REM Eyelid movements, he‘s visualizing dreamlike imagery that comes at the onset of sleep. He already made a number of VR Environments using that technique. He also uses smells and other things that might intrude him during dreams. Frederik is a copywriter who is working on a breakthrough novel. He wouldn‘t call himself very creative, that‘s why he uses a dream-enhancement device as a tool to induce creativity in his dreams. He constructs stories, environments & personas and uses his dream state as kind of a theater setting. He is a very lucid dreamer but does not set himself into the foreground. He uses his dream to be a puppet master. He constructs a story in his dreams and in his awakening state puts it into words. Samara works for an innovative agency that introduced her to this new creative-enhancement dream-device. 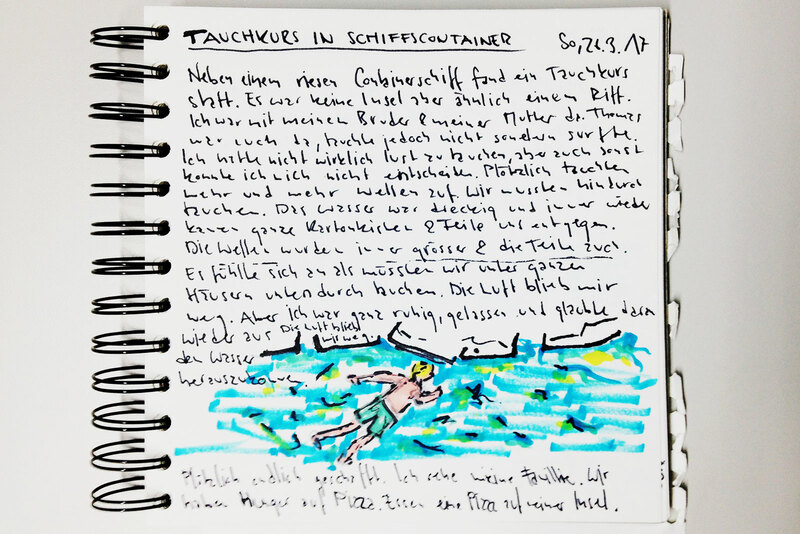 Designers in the future don‘t use a sketch or note book anymore but have a visual dream journal where they sketch and write down everything that they dreamed about. She occasionally starts drawing something that she wants to find out during dream time (like a problem or state of art with a note what she needs to find out and infuse this into her dreams). She also uses real-time elements & worlds as well as the current social context in her dreams. In a lucid dream state, she starts her creative work. With imagination & possibilities far from our physical laws, she conducts her problems from a totally different perspective.  After a dream, she starts visualizing what she saw and combines it with her research. She only works actively 3-4 hours a day. During this time she is even allowed to do short naps in a specific dream place situated in the office, where also other creative dreamers solve problems during sleep time. A big part of my project is based on experiments that I conducted on myself. I started to induce my sleep and dream phases with different methods and prototypes. My initial goal was to finally dream lucid and also to see what outer influences can have on my sleep and dreams but as my project evolved I‘ve changed direction a little bit. Some of those experiments are based on lucid dreaming and psychological methods, other ideas are based on a possible dream device. Those experiments should also encourage you to try it out yourself. A simple step-by-step guide and goals that I set for myself should help you to become a professional dreamer yourself. You can find all experiments on my project blog. The main goal of this experiment was to be more aware of my dreams but also when I‘m in a conscious state (awake) and when not (dreaming). As we dream our perception is not as sharp as in reality and through this, we see things a little bit blurred – especially text – and therefore we can get aware if we are dreaming right now. During the time I followed this method to dream lucid, I‘ve never had a lucid dream. However, it was the first step to become a professional dreamer and gave me a first touch point and experience with what it means to be more aware of dreaming. Also, it brought me to other methods and experiments that should enhance lucid dreaming. 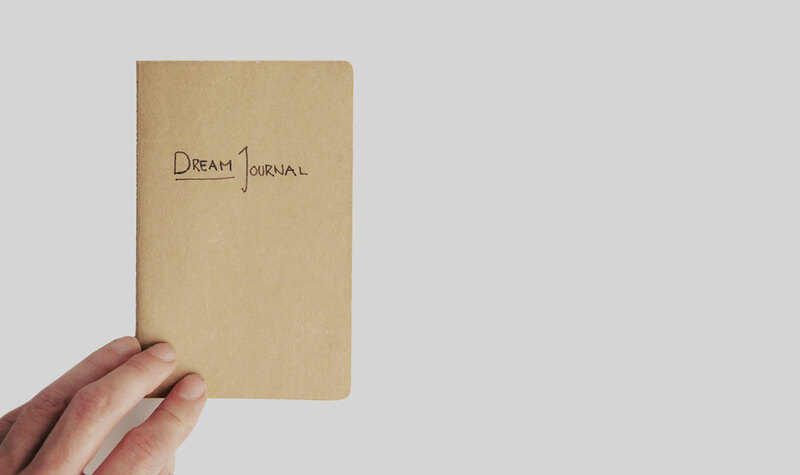 The dream journal was an important part of my project process as it helped me to record my dreams. I‘ve started with simply writing down my dreams each morning. In a next step I started to make connections between my daily life and my dream life. I wrote down daily activities from the past but also the present that was connected to my dreams. In a further step, I also started drawing my dreams. With the dream journal, I got way more aware of my dreams. As it was pretty hard to remember my dreams every morning when I would wake up, it got easier and easier over time. I could sometimes even remember up to three dreams each night. During the time I used my dream journal, I dreamed a lot about the sea, surfing, but also driving in cars. Twice I‘ve survived a plane crash, once I jumped off a cliff and a lot of those exciting stories had a cast of people I was familiar with. Another thing I found out with the help of my dream journal was that I‘ve dreamed a few times about the exact same mysterious island. I would even call it my island, because I think it is a place that doesn‘t exist in real life but a place that I architected myself. I knew where specific things were and I found myself a lot just walking around the island enjoying the sunset, searching for a street that I just couldn‘t find anymore, driving around in the subway, sometimes alone and sometimes with friends. The dream journal gave me a closer view of what was important to me while dreaming. Especially the sometimes very weird dream stories and also the scene changes motivated me for some further experiments and research. Building upon the Dream like Fellini experiment of capturing my dreams and further research how we are dreaming the Google Image Dream Search Engine idea evolved. With the help of Image Databases or Search Engines like the one from Google you could search for images to capture your dreams. Afterwards the idea would be to play around with the images, editing, collaging or just put them into a sequence that makes sense. I was dreaming that I was in a car, a car that was flying. But not a futuristic one, it was an old car. And I think it was orange. But I was actually sitting inside the car. 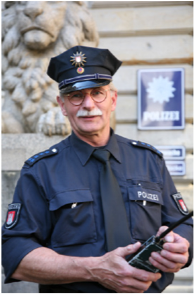 And two police officers were chasing me. They were wearing yellow/transparent overlays. And at some point I was hungry. The result was a short performance during an interim presentation where I tried to tell one of my dreams with the help of the pictures I found. This performance was based on my dream report and images that I did pile up on top of each other. When you try to remember one of your dreams then most of the time you start with a very basic narration and through this narration new elements come to mind that gives the dreams more depths. At some point during my self-experimentation phase, I asked myself again, what is actually the most satisfying experience we can have with dreams? And where do we already interact with our dreams? Of course it’s dreaming itself but as I found out in my research also dream sharing. As soon as I started to talk to someone about what I‘m currently investigating, they interrupted me with something like: “Oh interesting… I had a very weird dream last night.” Or, “I recently had this dream about somebody, but I don’t know if I should tell it to this person”. Dream Sharing seems a very important factor in processing our dreams. Following this idea I thought about three different scenarios and rapid prototyping ideas. A dream platform where you could actively share any kind of dreams with other fellow dreamers. More profoundly this idea would involve a device to share your dream reports to others or save them for later. A small record and play system that is notifying you when you receive a dream. Similar to Snapchat – you could only listen to the dreams once. Building upon this idea, I started to tweet my dream reports and also share my thoughts about dreaming, my day dreams and other dream related content. How can we reflect on our dreams just after awakening but as well during the day? Is a dream/day journal useful? How can we share our dreams with other? How can we build collective stories? A phone call service that wakes you up and connects you to a fellow dreamer to exchange dreams. What impact can dreams from other people have on your own dreams or perception? How does it feel to tell your dream to a stranger or how does it feel to waken up by a phone call and receive a dream report? A wearable that vibrates or notifies you when someone dreamed about you or mentioned your name in a dream report. How can we connect dreamers around the world? What physical sensation makes sense to notify someone, that someone else dreamed about him/her? You can find more of my self-experiments as well as some simple instructions how to become a professional dreamer yourself. Based on my self-experiments and my dream journal I also wanted to find out how other people dream. A cultural probe helped me in this research phase. It started with a blog post that I shared over social media, where I was looking for fellow creative dreamers that would like to know how we may dream in the future or how to enhance dreams for creative problem solving tasks. Furthermore I also asked some of my friends if they were also interested. From the beginning it was important for me to not only have close friends that would participate in this probe but also people I don‘t know at all or just briefly – for this I used my network on Linkedin, where I got in contact with some unknown dreamers. The ingredients for the final dreaming kit: 1. Dream Journal to capture your dreams immediately after awakening. 2. 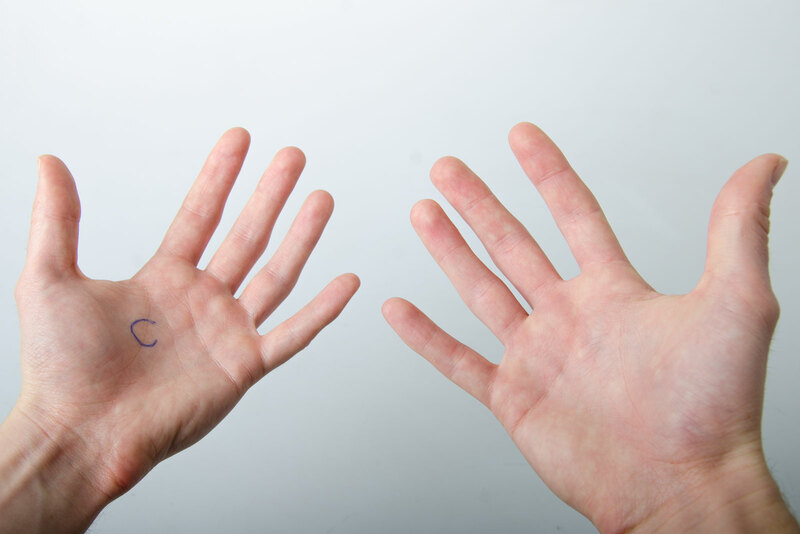 Conscious Marker to write a big C for Conscious on your hand and reflect if you are dreaming or not. 3. Subconscious Camera to capture moments or elements that are related to your dreams and also to capture the places where you normally dream. 4. 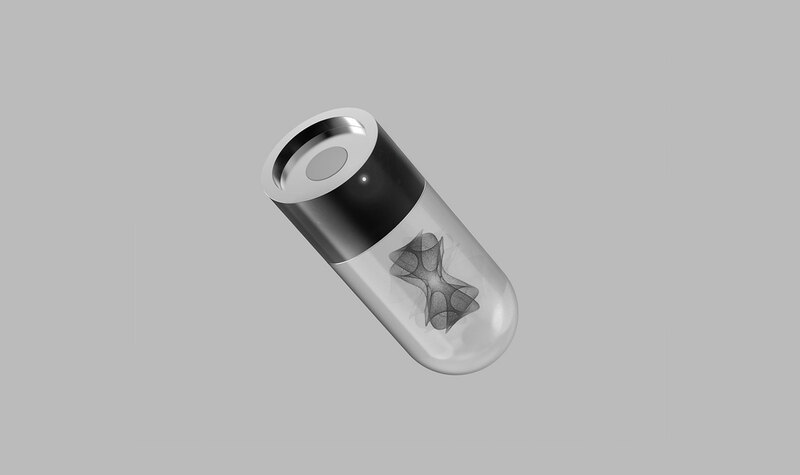 (Mysterious) Dream pills for use when you can‘t dream. 5. Magic Clay will help you sculpt your dreams and turn them into reality. With nowadays technology and also the growing quantified-self market, analyzing data is a big thing. So I thought it’s probably only a matter of time till we start analyzing our dreams with Artificial Intelligence. Based on my research and self experiment, I came to the conclusion that emotions are the most valuable experience we have in dreams but also that those emotions can be very sensitive and individual. 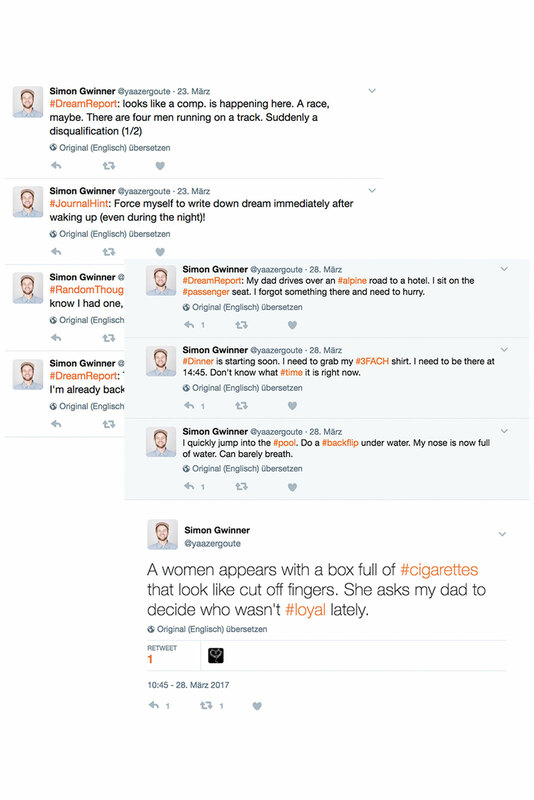 I started a simple experiments, where I analyzed my dream reports on emotions with the help of IBMs Watson AI and the open API called Tone Analyzer. The Tone Analyzer uses linguistic analysis to detect three types of tones in written text: emotions, social tendencies, and writing style. 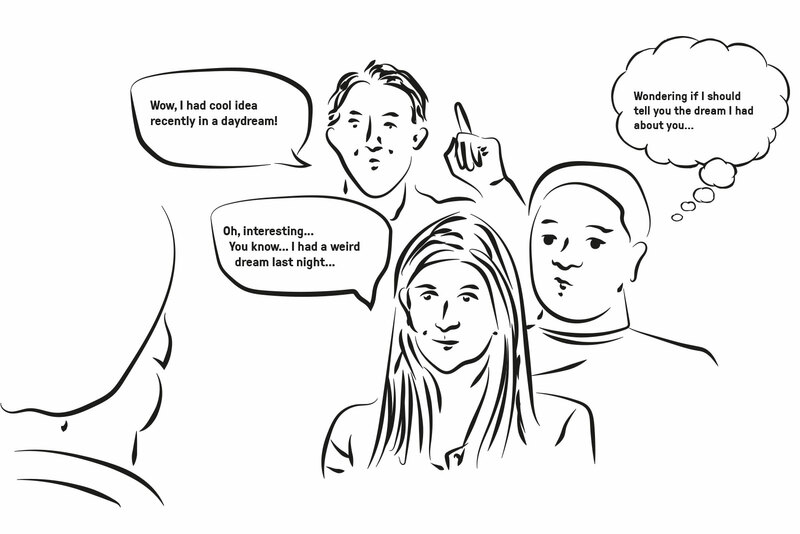 With the help of this service someone can understand emotional context of conversations and communications. You should use this insight to respond in an appropriate manner. With the help the low code development platform Stamplay, I’ve managed to connect text messages send within Telegram App to a corresponding Dream Analyzer Bot with IBMs Tone Analyzer API. Those messages would then be analyzed for five emotional states.  Afterwards, a bot can send a message with the analyzed data back to the dreamer or can even give more personal feedback. A more speculative idea of this could be a Dream Prediction AI, which I already mention in my self-experimentation phase. A further iteration of the dream analytic idea became a rapid prototype of a Dream Analyzing Bot. Dreamers can share their dreams with the bot and according to the dream report the bot gives the users back some emotional data. The bot works through text messaging app Telegram, connected with the Tone-Analyzer API from IBMs Watson. The goal was to find out how that analytics represent the feelings you may have during your dream or just after awakening. I was also interested in finding out if it is valuable to trust the emotional output of a bot just from a dream description. At some point I also implemented emojis that the dreamer receives when one emotion is very high. I was aware that the API is not really meant to find out how someone felt during an event and more focussing on how something is formulated and written. The analytics are depending heavily on how a dreamer is describing the dream – the content of the dream. More precise and thoughtful dream reports that already include feelings gave other results as very brief, unemotional descriptions of dreams. The analytics also represent somehow, how someone else could interpret the emotional state of an external dream, when hearing it for the first time. User tests also validated my assumption. However what was way more interesting to observe was, that after some people saw the results from the bot, they were a little bit perlexed and unsure if the results would be more accurate than their real feelings. A lot of people also asked what‘s behind the bot and how it works. Funnily simple answers like: „It‘s a Tone Analyzer from IBM Watson“, were already enough for the users. After a few self-experiments, I came to the conclusion that no visualization comes close to what we experience in dreams. Also when sharing dreams, the perception of dreams is very individual for all of us. However it is interesting that even blind people have sort of a similar perception of the world as people with sight. That’s probably the cause because of the descriptions and story tellings blind people get from people with sight. For example: A sun has to be round and is shining. An interesting investigation from graphic designer and artist Tobias Gutmann shows that a lot of people are stuck with a conventional representation of the world. He asked people with different cultural backgrounds to draw a house and a world. The similarities and differences between people with different background and especially kids are impressive. I came to the conclusion that perception of the world can be very individual. Especially when compared with kids, people from non-western countries or even computers. The same applies for dreams. As dreams are fractals from something we maybe have experienced or not and put together in a way that most of the time doesn’t really makes sense. There are gaps between our dream stories that we try to fill with information we gathered from non-dreams. You could go further and say that as soon as you share a dream, it is no more your dream but now the dream of someone else. Because this person is interpreting the dream from a different angle. I set myself the goal to find out how we can generate a (kind of) language for dreams with creative coding. Therefore I‘ve investigated some time to learn and refresh my creative coding skills and generative art forms in general. I did a few iterations testing different visual outputs with tutorials, open source codes and my coding knowledge from the past. I played around with simple meta-balls, more complex 3D supershapes, experimented with voroni shapes, perlin noise and flow fields. At some point I came over fractal flames. 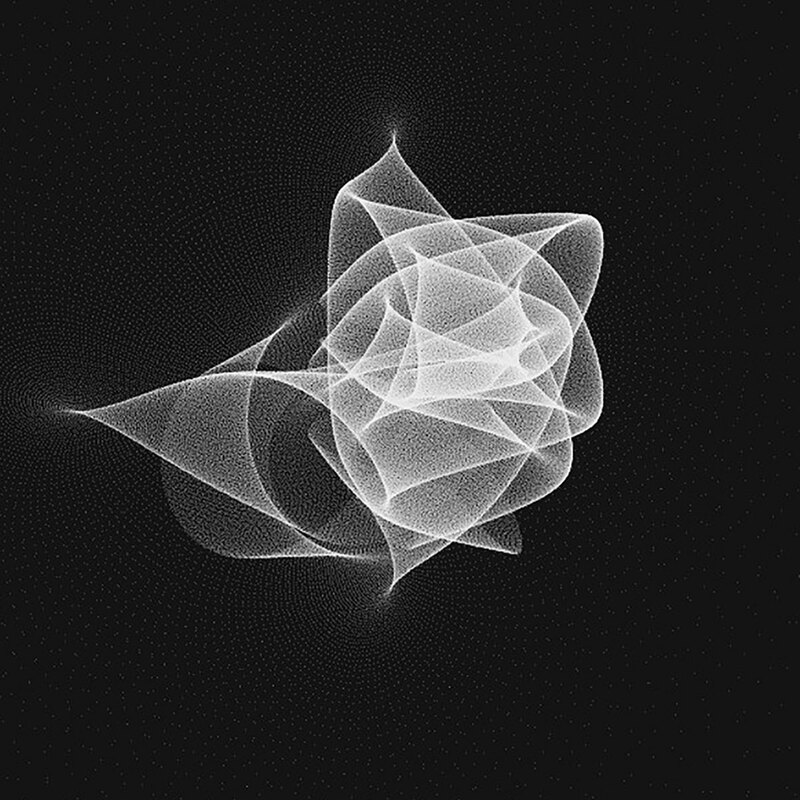 A tutorial from Tsulej helped me to handle those in processing. 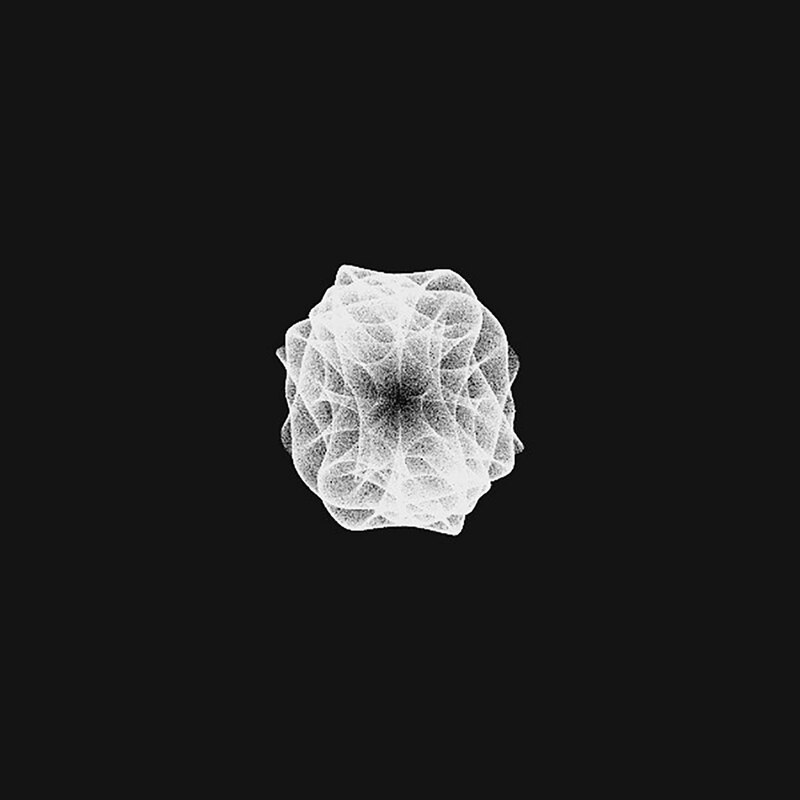 The output was minimalistic, yet very beautiful generative look of a point grid that I could manipulate and enhance with some tweaks. 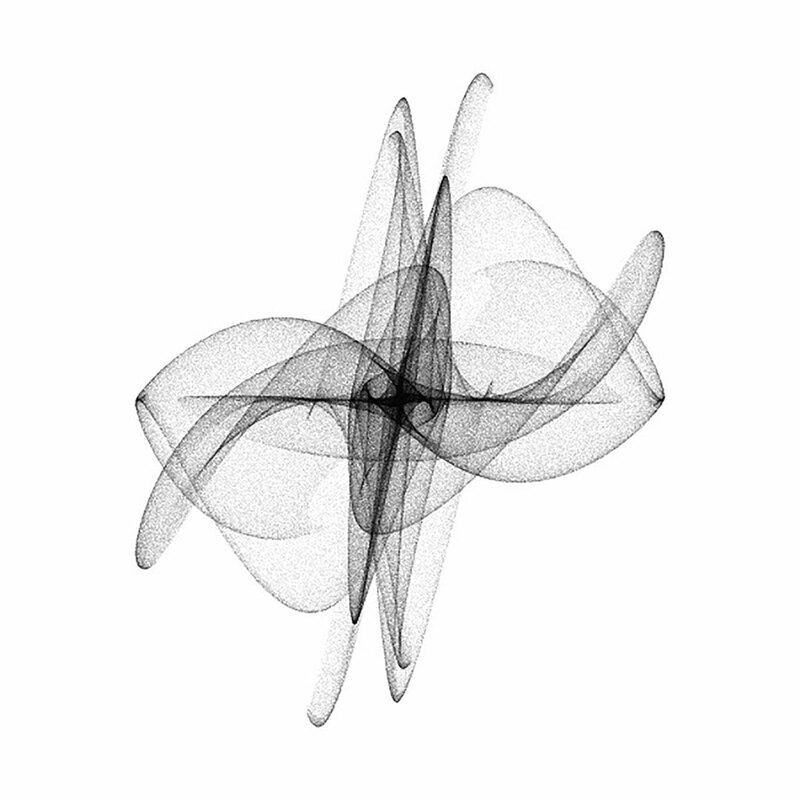 The emerging shapes do vary a lot from each other, only with some small math changes. Therefore those would differentiate and leave enough space for interpretation. In a next step, I wanted to find out if specific movements or shapes could be retraced to specific emotions or would have similarities. 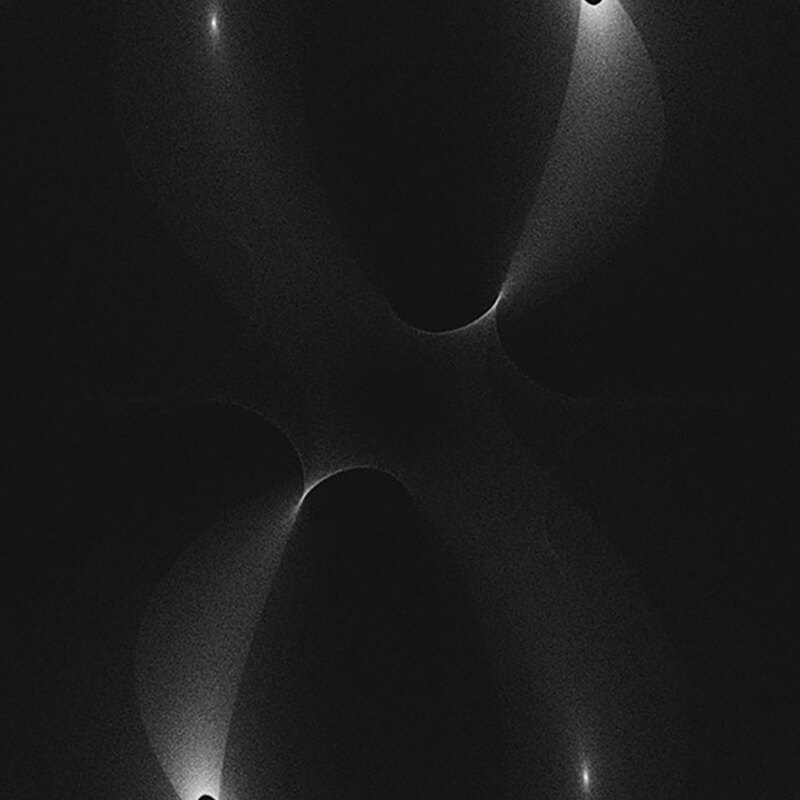 Through variations and math formulas you can generate different shapes in fractal flames. 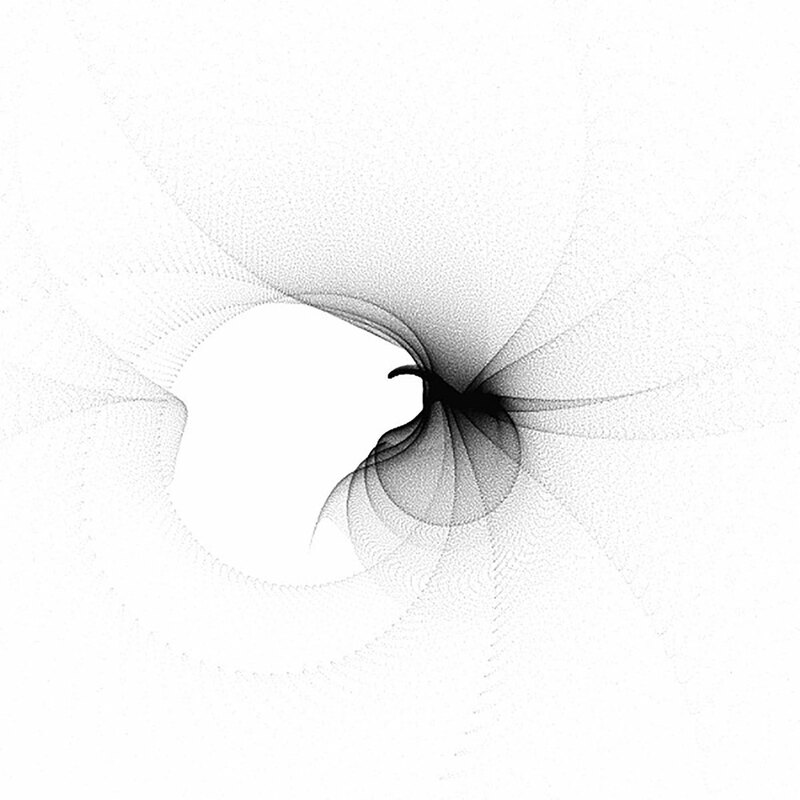 I investigated more time into finding out how I could use those generative drawings in my final project and how I could implement them into a device. Based on my research phase, the insights i gathered through my self-experiments as well as the then still ongoing cultural probe it was time to decide the final outcome of my project. The dream collecting and sharing ideas correlated the most to my thesis, so I decided to build a wearable dream collector. It was important to have something physical that I could use to test with dreamers and iterate on the interaction-side. 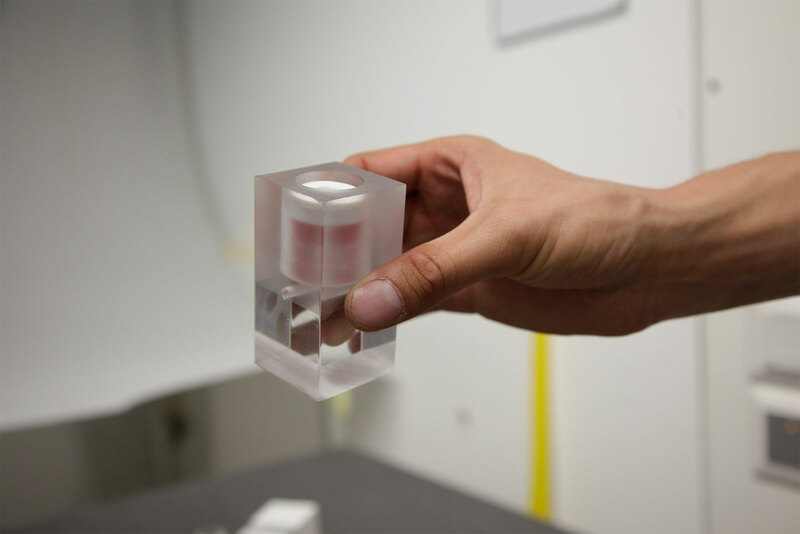 After a few simple prototypes it was already possible to find out more about the physical experience someone could have with the device. A few iterations later a first working prototype was ready. Further (rapid)prototyping and investigations into how such a device could look and act like helped me to outline my final prototype and the surrounding universe around the device. The device is a speculative approach of a quantified dream device that embodies dreams in a simple yet mysterious way. 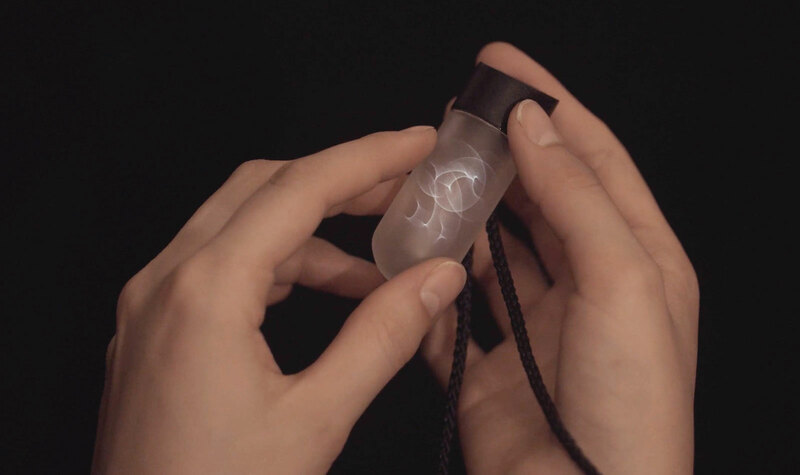 Its called Luce and consists of a microphone piece to record your dreams, and a scientific-looking glass. In the glass evolves a holographic representation of what Luce is dreaming about based on a dream report from a dreamer. The algorithm behind Luce is recording the dream of the dreamer, for example: „I was a deer, a beautiful deer, a deer made of rainbow shiny colors and I was jumping through the forest.“ This recording gets converted into a dream poem. „Corsetiere beautiful dirty made out of rainbow shiny colors Krautwurst Jumping through the forest.“ The poem gets analyzed into four emotions. Anger, Fear, Joy & Sadness. Furthermore, those values influence a math code that creates those beautiful fractals inside the glass. Based on research in how current wearables and quantified-self products look and act like and knowledge I gathered from my general research in dreams, the product design for Luce evolved. Currently, there‘s a trend to wearables that looks more like fashion accessories than technology. The technology is not visible and those solutions try to play with specific lifestyles to give their products more depth. I also did some research in general product design trends building up on my visual-research in dreams. The collection on my Pinterest wall sums up the research of this phase. I‘ve build a few solid prototypes with the help of 3D software and a 3D printer. I played around with different forms as well as materials. The device should feel weightless and elegant as it was meant to be worn around the neck. Also it should be a symbol of recognition for others, similar to a Mantra. The product consists of two parts. In the top of the device there is a tiny Bluetooth microphone to record the dream report. The bottom it a tiny scientific looking glass with a speculative holographic representation of the dream. Looking back, this phase was an important part of my project outcome, because I wanted to make my final product as feasible as possible. The reason why I wanted to build a working prototype was also to find out more how someone would interact with such a device as well as to find out how such a device would already be possible to be manufactured. The final 3D rendering was made in collaboration with Industrial Designer Alexander Häberlin. The digital design process was as important for the project outcome as the product design process. Especially as I wanted something interactive for the exhibition.  The idea was to build a program that would convert speech-to-text, analyze the dream report and transform it into a generative sculpture. I‘ve written the code in java through Processing. A lot of tutorials, open-source codes and hacks helped me to build the core code for my project. I was able to raise a connection between processing and the web with the help of the websocket library. The speech-to-text is working via Google chromes build-in Microphone API. I get the emotion values from IBM Watson Bluemix service and an API called Tone Analyzer. 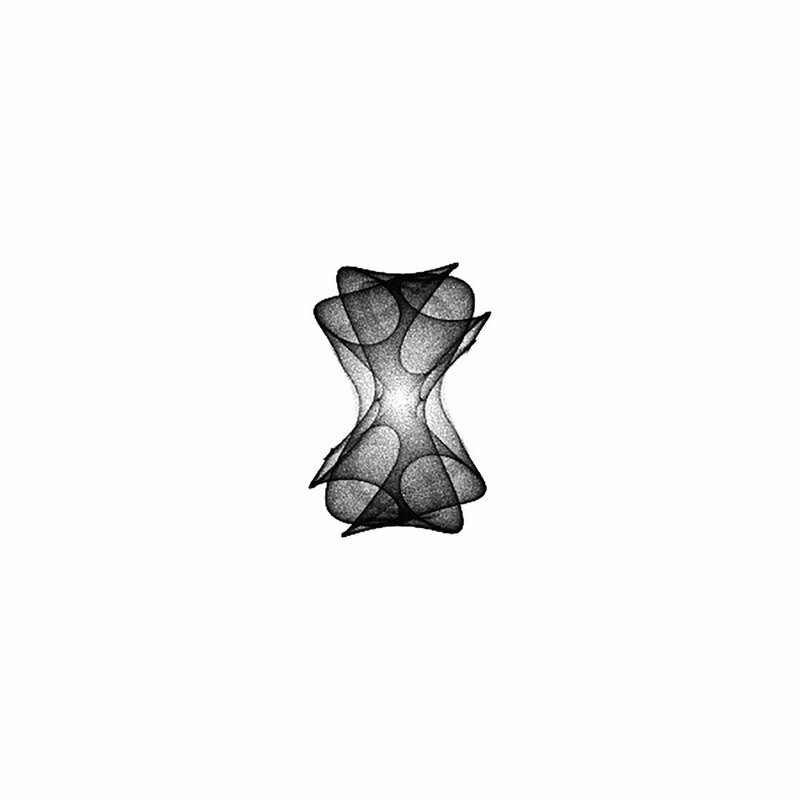 And furthermore the generative fractals are based on a tutorial about fractal folds. 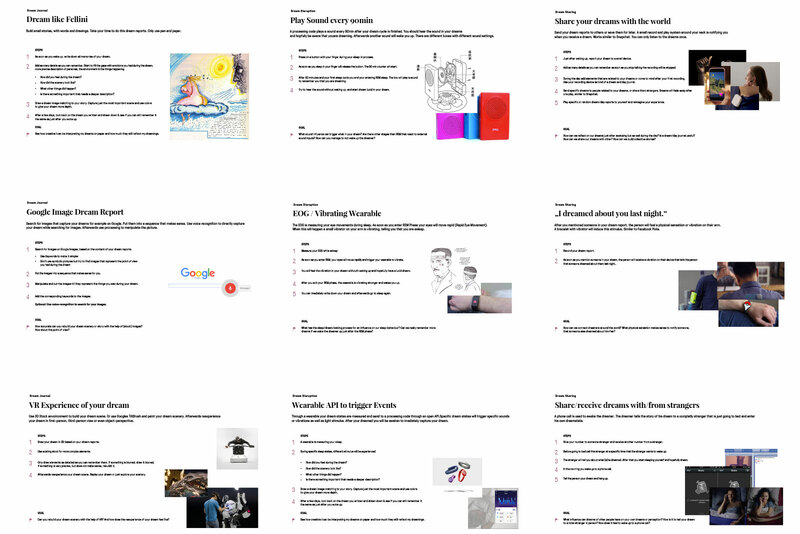 Another layer of the exhibition concept is based on the Google Image Dream Search Engine experiment. As soon as someone is talking into the device, a continuous stream of inputs is analyzed for keywords with a Natural Language API. Afterwards those keywords are sent to the Google Search API which sends back images based on the search terms. For the speculative product only the visualization would be prominent, however for the exhibition I wanted to give the visitor a look behind the algorithm and the processing of the inital dream reports. 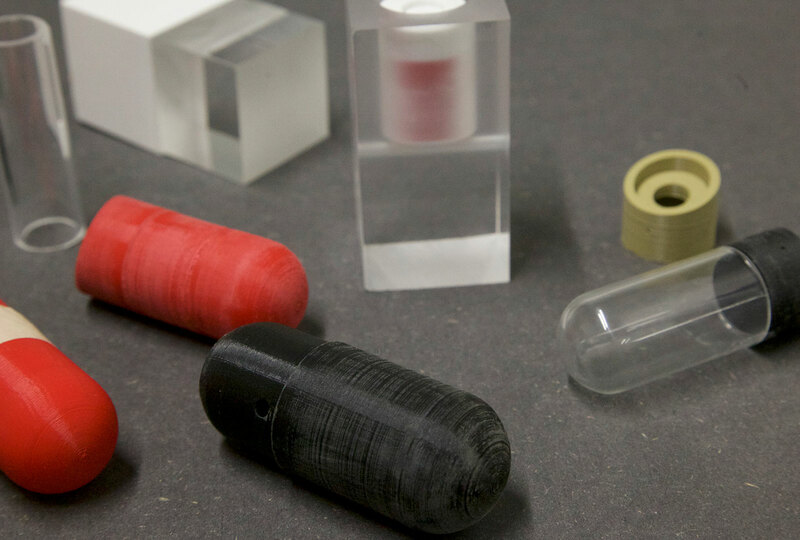 The final prototype consists of a 3D printed casing for the microphone and an LED light and a custom glass tube that glass fabric Glassform manufactured. 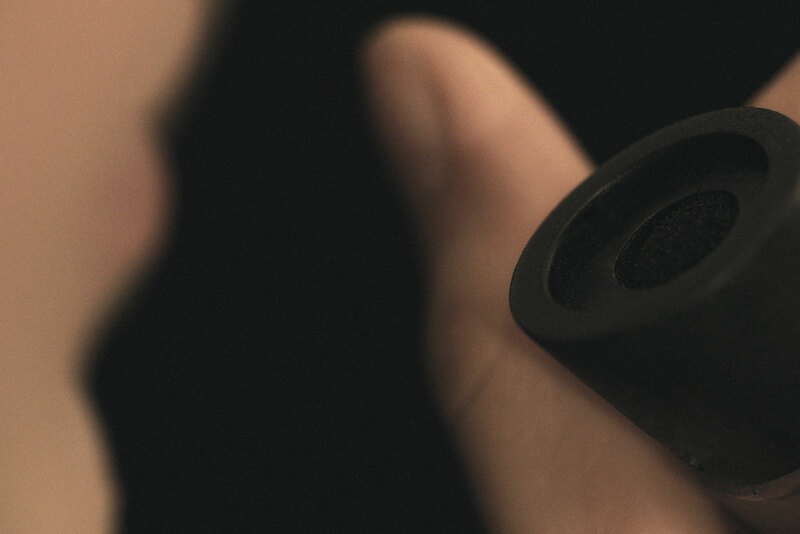 The tiny Bluetooth microphone used in the final prototype is from a free speech Bluetooth headset. 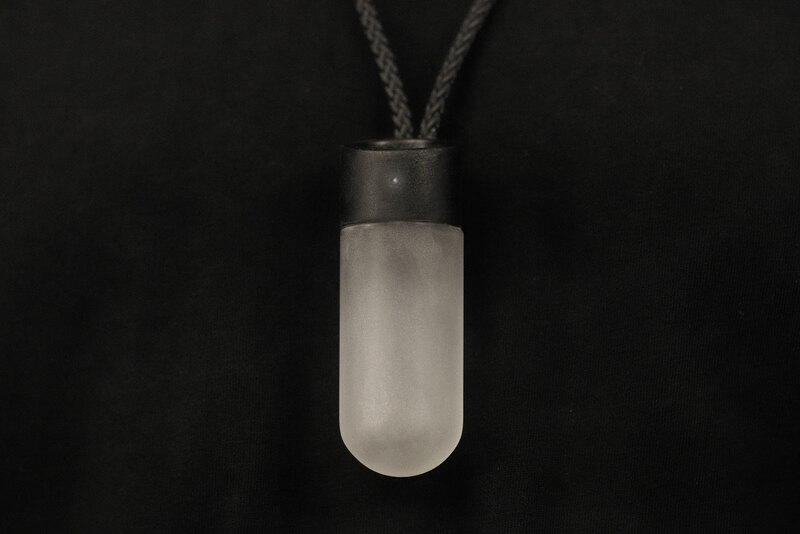 The necklace is currently a black cord but could also be a half transparent cord. My intention was to let the device look like it would levitate on the chest of the dreamer. However the device can also be worn in other ways. The Universe describes the whole environment around the product. It includes interactions with the device but also digital services where dreams would be stored, meet each other or even fuse into new dreams. Storytelling helped me to find out how this universe surrounding Luce could look and act like and also had a big impact on the interaction thoughts for the final physical prototype. Designing a (digital) dream network where dreamers could interact further with their own dreams but also dreams from other people could be a next step in the process of this project. However as time was limited and it was only working alone on this project. I decided to focus first on designing the interaction with the device itself and let the stories surrounding Luce be stories – for now. 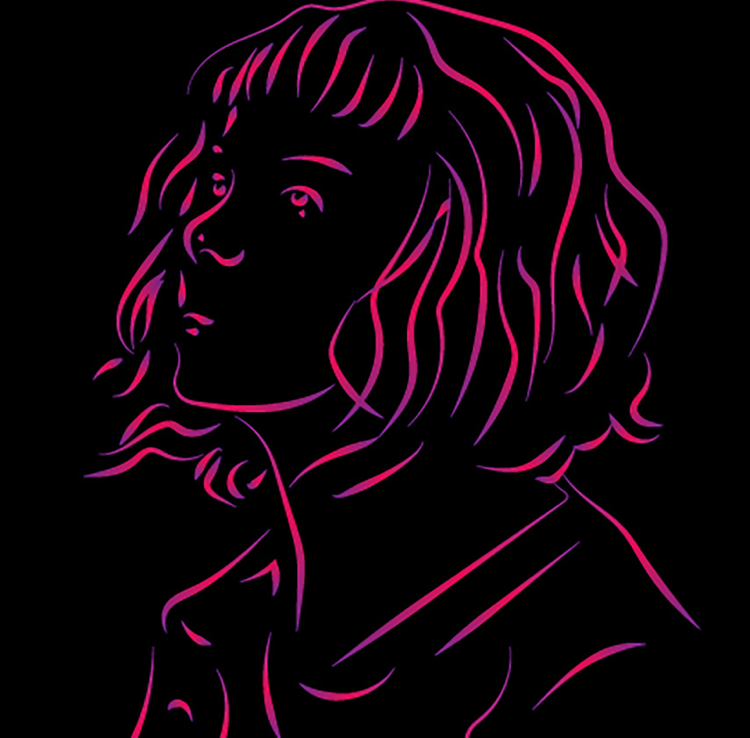 Lucy was the main protagonist to outline the universe of Luce. She is a young, smart and openminded teenager and self-proclaimed professional dreamer. Lucy works for an innovation agency. She is very curious and has interest in everything new as well as everyday happenings around her. Lucy is very tech-affine. She loves to try out new things and of course already tried out different quantified-self products, because a lot of the people around her do the same. However none of those products really appealed to her. Lucy doesn‘t really like data, she thinks plain numbers are boring and are reducing us to something very unfulfilled. Lucy is smart and aware that companies benefit from her recorded data. But she also wants to benefit from her own data. Products nourished by her should also help her actively explore her own body and mind instead of just represent what she already knows. She thinks that she is actually already very much in control of her own body and her life. She is running frequently, eats healthy etc. But one thing that‘s still a big mysterious for her is dreaming. She beliefs dreams reveal hidden messages of her but she doesn‘t belief in generic dream symbols. Still she would like something that gives her the possibility to explore her own dreams or share them with friends. Because for Lucy dreams are very personal and also reveal very interesting stories of herself. She could also imagine they could help her with problem solving tasks. Sometimes in the middle of the night, Lucy wakes up and feels very emotional. Most of the time this happens just after she experienced a vivid dream. Lucy also likes to day dream. While sitting close to the public bus window, watching the trees passing, her thoughts start to travel. Also in conversations with people, sometimes she‘s not really present in reality and as soon as she‘s back interrupts the other person and tells what she just (day) dreamed. Lucy's friends call her lovingly a professional dreamer. She really likes this description and also started to introduce herself as a professional dreamer to others and as well on social media. Of course always with a winking eye 😉. You can find more stories about how she is interacting with this speculative dream device as well as her very own view on her dreams and dreams from others on Medium. A place where dreams meet each other. The experience someone has with Luce itself is actually very simple. The dreamer tells a dream story to the device and based on this story the device generates its own dream. However to use the device someone needs to dream first. And I think that's the core experience someone should have when using Luce. As this experience is in its natural form already a very beautiful experience, I didn‘t want to intervene any further. Luce, therefore could be seen as a motivation for people to dream more often. But encounters between dreamers can also be a very interesting interaction someone could have when using Luce. As the dream is inside a clear glass, hanging around the neck of someone, the dream is visible to others as well. But everyone has its own interpretation of what is a good and a bad dream and what emotions are connected to those dreams. With Luce I wanted to encourage a new conversation with our dream and build an antithesis to the current quantified-self products on the market. A lot of those attempt to turn terabytes of data into insights in order to get a deep understanding of how we work. The uncreative way how these products provide us with those data - most of the time just plain numbers in boring graphs – and the quantitative rather than qualitative approach of how those products work, motivated me to do something different. I asked myself why don‘t we turn this thinking around and start playing with the numbers and the data in general? Let those numbers tell their own stories and influence something mysterious that changes perception and does not really foreground the question how does it work but rather gives enough space for own interpretations. Something that is meant to be figured out by the opposite and is asking questions rather than giving answers. This interaction and examination may (or may not) inspire and give the insights that are of relevance. In my exhibition space I want to play with the question „How does it work“ and a spontaneous interaction of recording a dream. 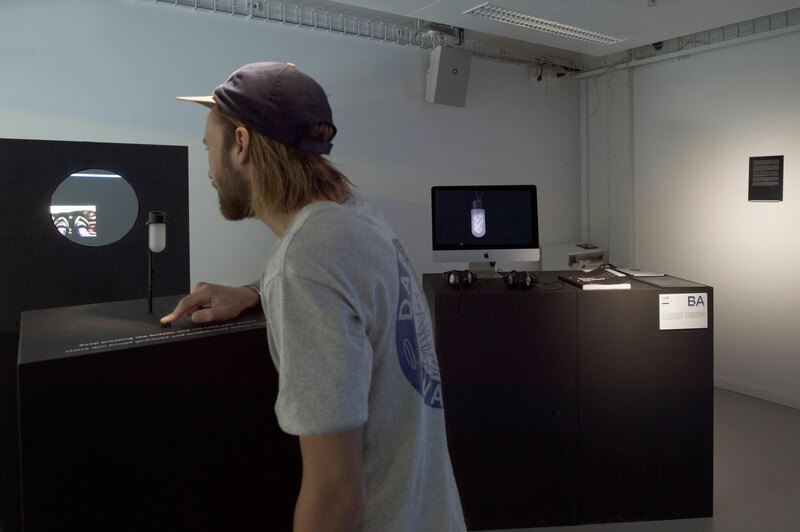 The main object besides the final prototype is an interactive installation where a dreamer can record a dream, that gets through the whole process of how the device processes those dream inputs, however the dreamer still has the opportunity to intervene in the process. A little bit like Lucid Dreaming. You can interact with the code but you don’t really know how it works. And you can even dream together. What I want to achieve with this is to open up a dialogue of how we interact with technology but also give the technology a human touch of forgiveness that furthermore can inspire us. The next step in this project would be to design a digital service around Luce – aka the universe. This would make the whole project probably also more feasible. Also I‘m now at the point to invest more time into user tests, see what works and what not and refine product and interaction design patterns. Besides designing a product and service, the installation for the exhibition could also work as a detached experience with multiple stations, similar to what I tried in my self-experiment phase. My intention was never to (just) design a product, a service or a new technology to enhance dreaming. What I wanted to achieve was designing around a culture that already exists. Creating narratives, enrich an experience & maybe even create a new vision that plays with what I think dreams are meant to be. Therefore I wouldn‘t categorize my outcome as only a product but more a future where dreamers can engage with their own dreams but also dreams from others. The last couple of months were a very intense examination of dreams but of course also technology and cultural/social subjects in general. I was able to find out what relevance dreams have in my life but also the life of others, also how they can be used in a creative process and how to design for such a sensitive topic. Furthermore the whole process of designing a speculative product as well as a working prototype (without the hologram) was very meaningful. I was able to use my superpowers but also learn new skills on the way. Especially storytelling and fiction writing was a very successful method to gather insights and design future scenarios. It also made me aware what design decisions can have what impacts on the person that would use such a product/service. Overall I would say that I jumped over some boundaries, learned new skills and even refreshed my coding skills. 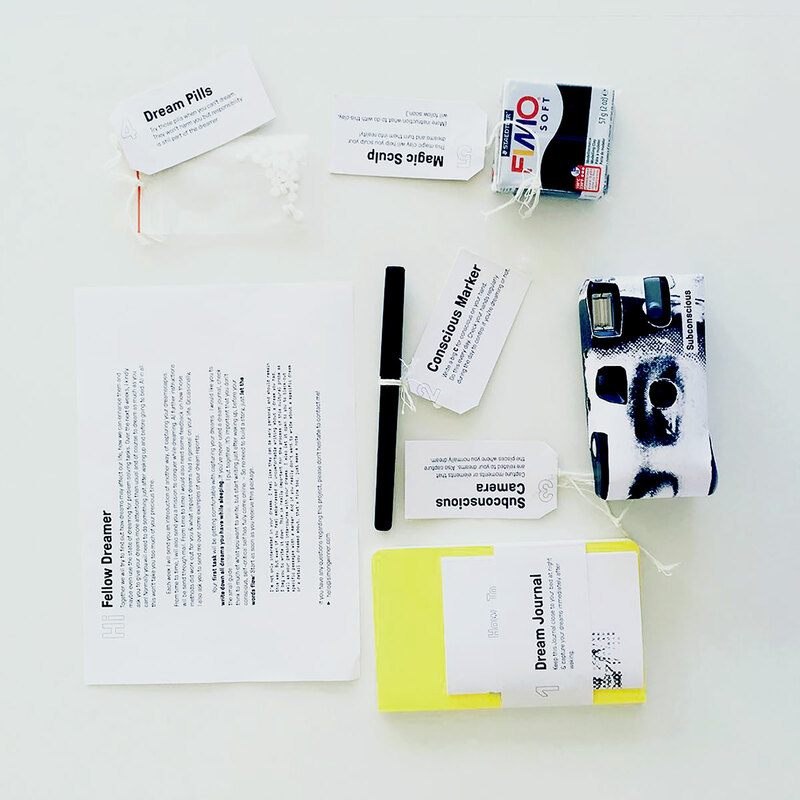 The cultural probe was an exciting but also time-consuming method to get in contact with other dreamers, learn and exchange knowledge that would influence further steps in my design process. First user test was also conducted in this phase which was very valuable. But the self-experiments and rapid prototypes helped me probably the most to decide which ideas to follow. Through further exchange with other dreamers and people about my ideas I was able to make the right decisions. Also with the help of other talented designers and people, I was able to transform my ideas into reality. And my ability to dream... I think I let my dreams stay dreams for now. Special thanks to my mentors Karmen Franinović and Luke Franzke for always challenging my ideas and the very insightful mentorings, Alexander Häberlin for the 3D rendering, 110 and Maurin Crameri for the video equipment and professional help with the video shoot, Lisa Mauriello for acting and hand modelling in front of the camera & Anna Bolzern for the voice-over in the final concept video and not to forget all the participants and fellow dreamers of the cultural probe. You all gave me some very intimate and interesting insights into your dreamscapes! Wanna know more about this project? Just reach out !